Woot woot and word up. In exactly one week's time we will have finished blowing sound down your earholes at the distinctly impressive Nottingham Contemporary - look, there's even a proper webpage and poster and everything here: http://www.nottinghamcontemporary.org/event/music-exchange-present-souvaris. Then you might have noticed that we're heading off for our holidays in late October, stopping off in Belgium, France, Germany and Switzerland for some quality shows (and Luxembourg for some cheap petrol, no doubt). But what are we going to do inbetween? Oh yeah, it's only our MOTHERFLIPPING TENTH BIRTHDAY. 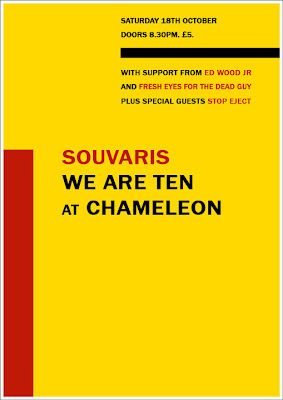 That's Saturday 16th October, at Chameleon, Nottingham. 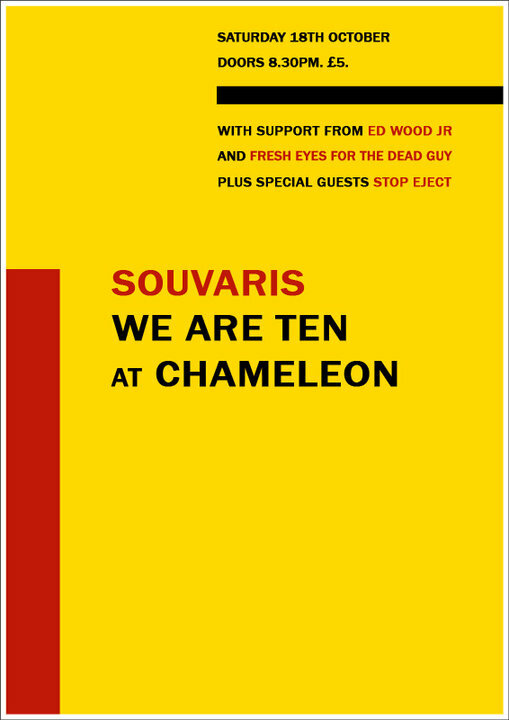 Clique Clack is delighted to invite you to a warm-up show for Souvaris' upcoming European tour. In the spirit of international exchange, Ed Wood Jr from Lille, France will be representing the froggy side of the Entente Cordiale. Add a couple of local rock behemoths to the proceedings in the form of Fresh Eyes For The Dead Guy and Stop Eject, and you have yourselves quite in evening indeed! Mmmmmm. See you there! Bring cake. It's gonna get messy. Yup, that's 4 countries in 9 days! And about 3,000-odd kilometres to cover. Our trusty driver Jim "Thing One" Alexander is already in training and licking his lips in anticipation. So come join us at a show if you feel so inclined (and live anywhere nearby)! We'll post some details about door times, prices and some of the lowlifes we'll be sharing a stage soon.